This recipe was in my standard shuffle of dinner recipes for quite a few years. After the switch to the primal lifestyle the masses still requested “Baklava salmon,” and it converted even better than the original, in my humble opinion! We have a “Christmas salmon fish,” as my kids deem it, every year on Christmas Eve and this debuted once again. 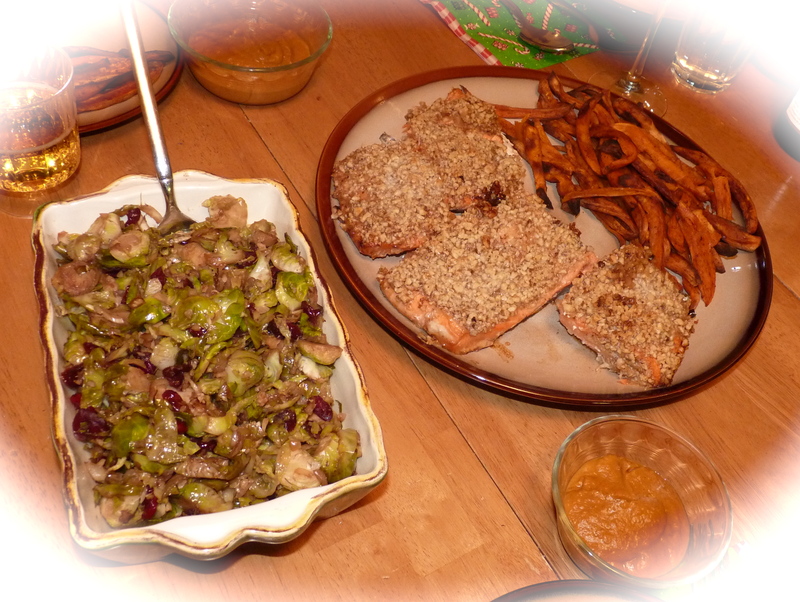 Paired with curried sweet potato/carrot soup (recipe to follow in a future post), some roasted sweet potato “fries” for my daughter who will not put anything remotely spicy to her lips, and Everyday Paleo’s holiday brussels sprouts, it was the perfect holiday celebration meal! Bake salmon for 12-15min until desired doneness. Enjoy, hopefully as much as my family does! I’m curious about the almond meal mentioned in the instructions. There isn’t any almond meal listed in the ingredient list… Thanks for clarifying! Good point let me clarify that with heather! Hi, So sorry, it is meant to be 1/4 cup almond flour.